Curator Yu-ping Luk takes a closer look at a remarkable painted scroll that illustrates scenes from early Chinese poetry. One of the exciting changes to the newly refurbished Sir Joseph Hotung Gallery of China and South Asia (Room 33) is the creation of a space designated for Chinese paintings, calligraphy and prints. Before the refurbishment, the light levels and a lack of bespoke cases for scrolls meant we couldn’t regularly display scrolls. Six scroll paintings are now on display – highlights selected to showcase a range of styles and subject matter. In this post, I will introduce one of these – Illustrations to the Odes of Chen, a handscroll painted by Ma Hezhi (fl. c. 1131–1162) of the Southern Song dynasty (1127–1279). The Southern Song emperor Gaozong (r. 1127–1162) commissioned the Illustrations to the Odes of Chen as part of an ambitious artistic project to illustrate all 305 poems compiled in China’s oldest poetry anthology, the Book of Odes (Shijing) (c. 1000–600 BC). It was intended to enhance the emperor’s legitimacy and to help revive the authority of the Song ruling household following the catastrophic loss of the capital and the northern part of China to the Jurchens, a semi-nomadic people from northeast Asia. Today 20 scrolls survive, but many are later copies. The art historian Julia Murray thinks that the British Museum’s version is likely to date to the Southern Song dynasty. The scroll consists of ten scenes that illustrate odes (or short folksongs and ballads) about the ancient State of Chen, which existed in the plains of what is now Henan province. The scroll follows the ‘Mao edition’ of the poems, compiled in the Han dynasty (206 BC–AD 220) by scholars with the family name Mao. This edition gives a short moral commentary on each of the poems. These are written on the handscroll as a preface to each of the ten poems. The writing is in the style of Gaozong’s calligraphy. The first two scenes of the scroll are now on display in Room 33. The first is titled ‘Wanqiu’, a place in the State of Chen. The calligraphic text for the first ode ‘Wanqiu’, in Ma Hezhi (fl. c. 1131–1162), Illustrations to the Odes of Chen. Handscroll, ink and colour on silk. According to the commentary from the Mao edition, this poem criticises the ruler of the State of Chen for his lascivious and excessive ways. More recent interpretations take a different view and suggest that the poem expresses longing towards a dancing female shaman. The painter of the scroll has followed the Mao edition by depicting only men performing ritual music and dance in the scene. Painting illustrating the ode ‘Wanqiu’. The figure facing the front and holding a feathered banner or whisk is most likely the ruler of the Chen State. At first the moral judgement expressed in the Mao edition does not seem obvious in the painting, but details suggest otherwise. For instance, the two musicians seated at the front have uncertain expressions on their faces, while the loosely painted wavy lines of the landscape create a sense of instability that echoes the unrestrained actions of the ruler. The second scene in the scroll is titled ‘White Elms at the East Gate’. The calligraphic text for the second ode ‘White Elms at the East Gate’. The subject of this poem is romance: women dance in the streets and couples go on excursions together. But the Mao edition condemns this behaviour as symptomatic of social disorder. It argues that as a result of the bad example set by the ruler of Chen, lax moral behaviour has spread among ordinary people who neglect their work and instead sing, dance and court each other in the marketplace. This second scene shows the wider social consequences of the first scene. Painting illustrating the ode ‘White Elms at the East Gate’. In the painting, a young woman below a tall elm tree gestures towards a young man on the other side of the tree. She is probably holding a small stalk of the pepper plant mentioned in the poem. Clearly, she is interested in the young man. The response of the young man, however, is more ambiguous. Is he turning towards her or away from her? Detail from the painting illustrating the ode ‘White Elms at the East Gate’. This interaction reminds me of a famous scene in the Admonitions Scroll, which is also about proper interactions between men and women, and likewise open to different readings. 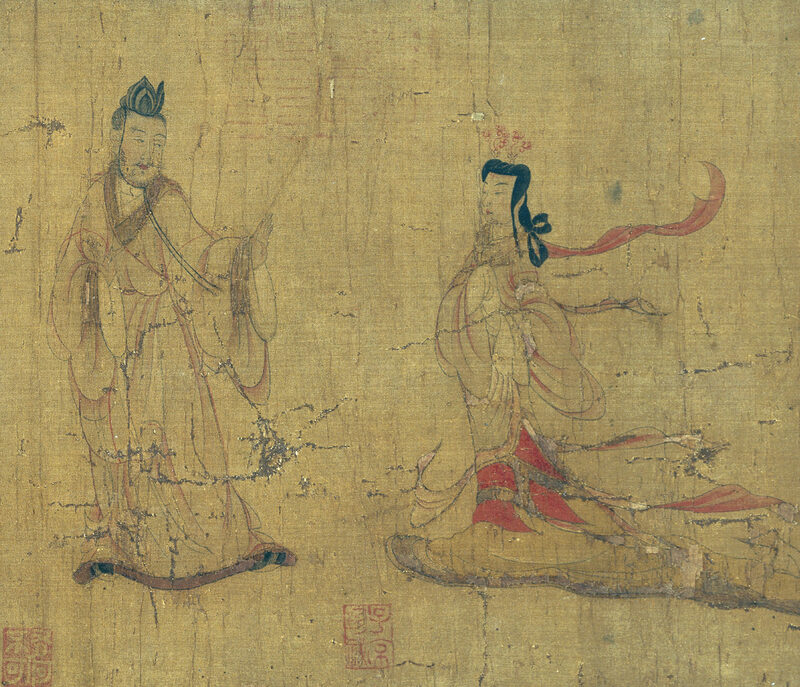 The Admonitions of the Instructress to the Court Ladies (detail) attributed to Gu Kaizhi (c. 344–c. 406). Panel mounted handscroll, ink and colours on silk, c. 5th–6th century AD. In addition, the flowing lines, the fluttering ribbons and dress of the figures painted by Ma Hezhi are reminiscent of the Admonitions Scroll. 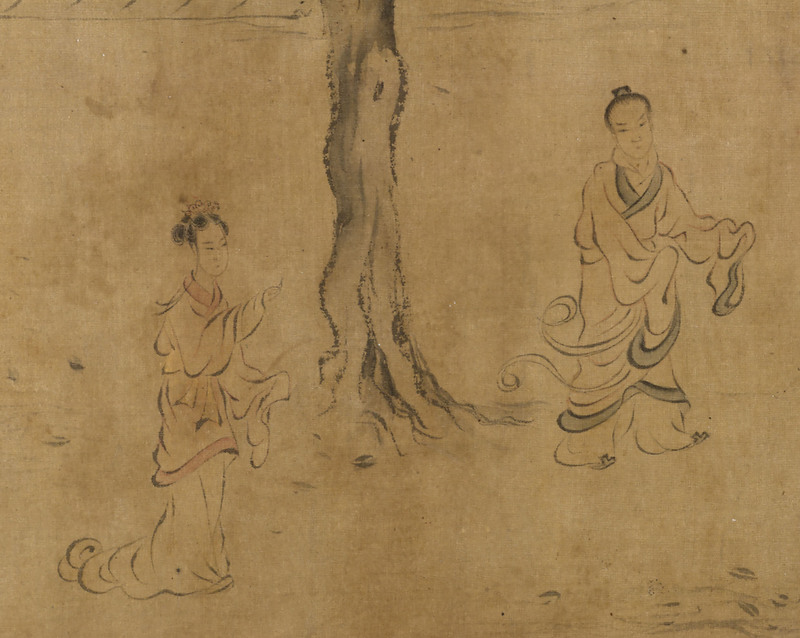 This suggests the legacy of Gu Kaizhi’s style of figure painting in the Song dynasty. The painter in the Illustrations to the Odes of Chen has followed the poem closely by setting the scene in a marketplace. There is a shop selling grains in the background. Men and women in the street, including the shopkeeper, look on with surprise and disapproval at the young couple and their actions. 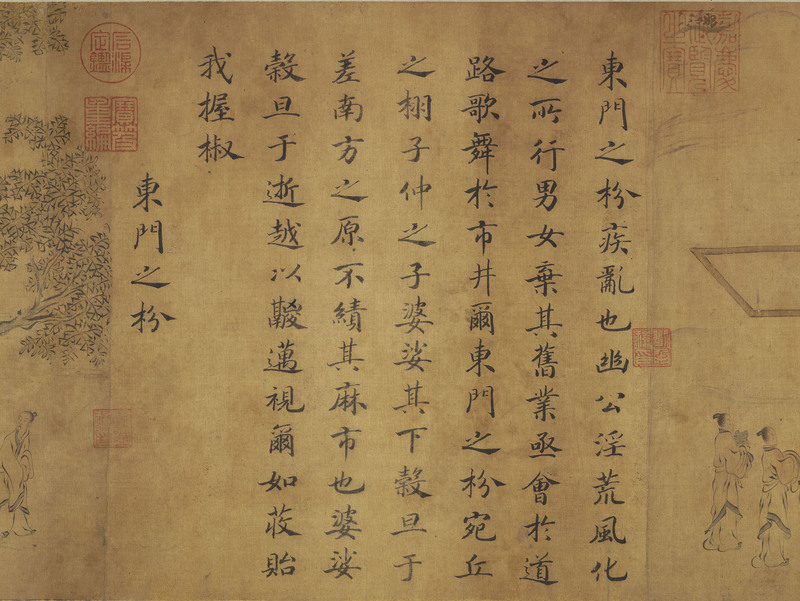 This scroll promotes a strict sense of morality and proper behaviour, in which the emperor Gaozong as calligrapher-patron is presented as the arbiter. 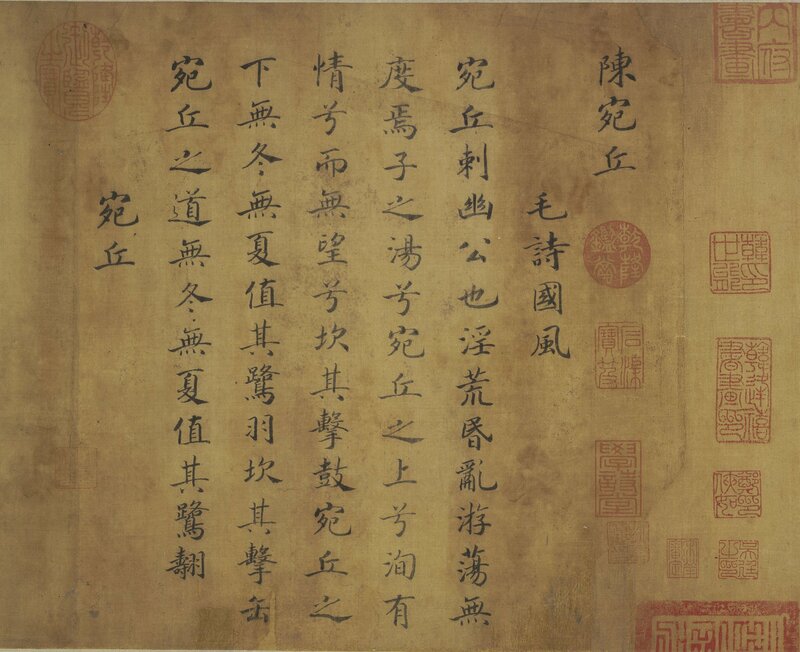 After the ten scenes, there is a colophon by the important late Ming painter Dong Qichang (1555–1636) and an inscription by the Qianlong emperor (r. 1736–1795). Seal marks indicate that this painting was once in the Qing imperial collections. At the end of the scroll is a seal that refers to the major connoisseur and collector of Chinese paintings C C Wang (1907–2003). The British Museum purchased this scroll in 1964 from Denise Ellenburger-Loo. Due to the size of the case, only two scenes can be shown at a time, so different sections from the scroll will be displayed in future rotations. The gallery’s refurbishment marks a new era for displaying Chinese paintings in the Museum. You can see this handscroll on display in the Sir Joseph Hotung Gallery of China and South Asia.